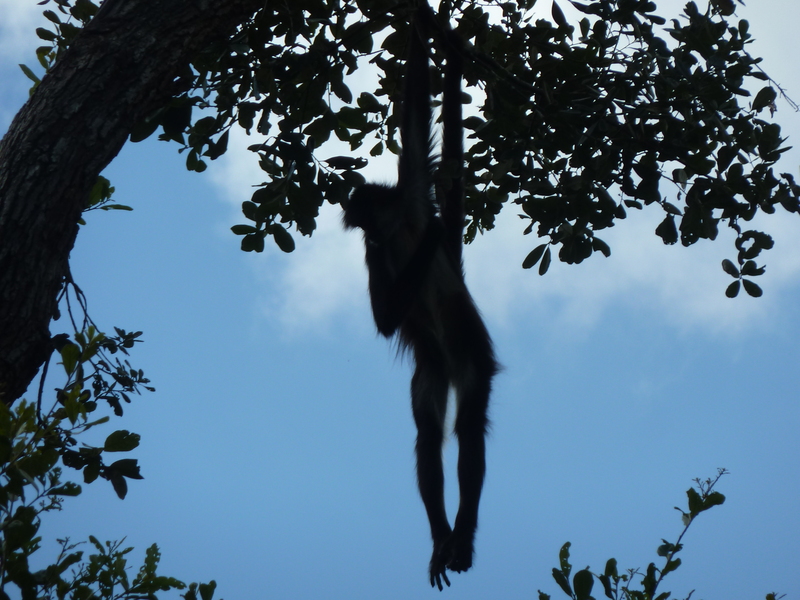 Hanging out up at “The Rock” with my spider monkey pal. Read on, thrill seekers. which can be found by clicking here. 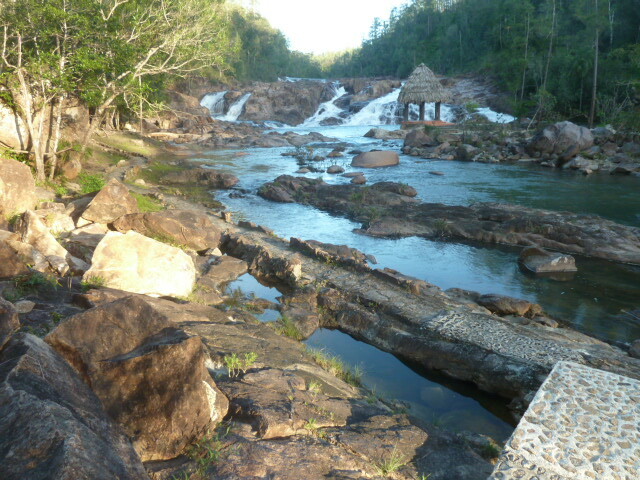 And for a bonus here’s some pix I took on a Saturday outing at a couple of magnificent, secluded waterfalls and swimming holes up in the rugged frontier country of Mountain Pine Ridge. Huffington’s article makes no mention of all the great places for hiking, swimming, caving, tubing and canoeing. 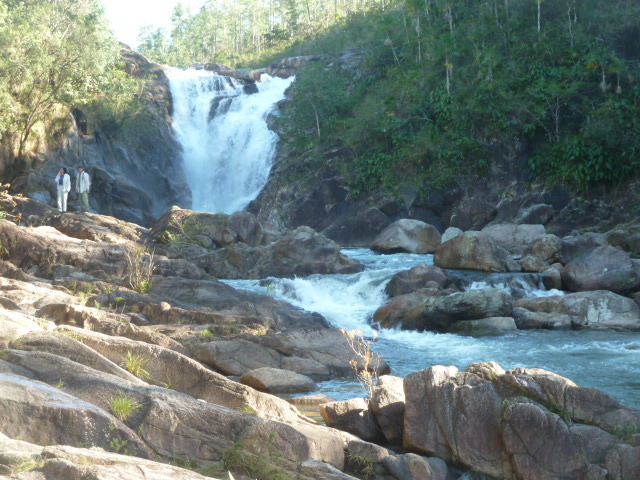 Saturday was a gorgeous day and I drove up to the rugged frontier country that is Mountain Pine Ridge to explore this waterfall known as “The Rock.” The trails to places like this in Belize can be steep and rugged but the payoff can be a place as ruggedly beautiful and peaceful as this. Down at “The Rock” I met the guy in the red shirt, Chad Burrow, from Arizona, who is with the National Parks Service and once spent six years as a Park Ranger at the Grand Canyon. He was here to teach students from San Ignacio’s Sacred Heart College on “the principles and applications of Sustainable Trail Design.” The students and other volunteers camped more than a week at “Big Rock” improving the trail down to the site and making it more accessible. 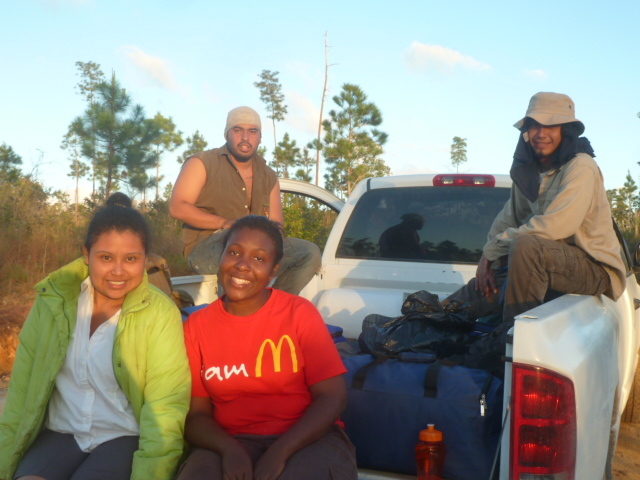 Since the group of campers had completed the trail improvement project and training ahead of schedule, these four college students asked to ride back to San Ignacio with me–after a week of camping they were ready to sleep in their own beds Saturday night. 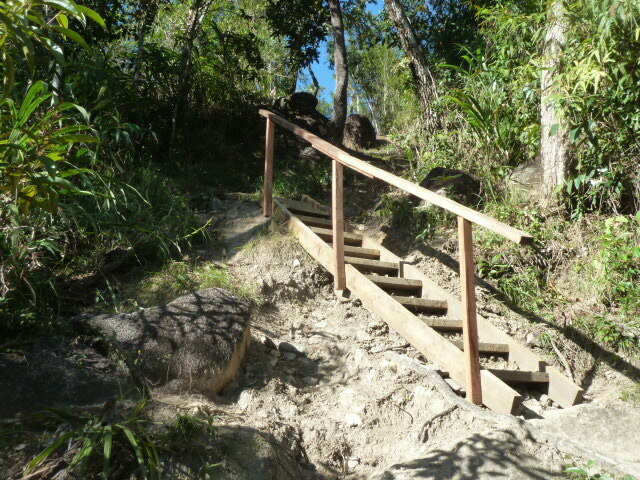 The trail down to the waterfall at Big Rock is still steep but easier thanks to the improvements made by the volunteer campers from San Ignacio and American Chad Burrow. Chad told me he went to college in the States with an instructor at Sacred Heart and comes to Belize often to see him and soak up some of the beauty of Belize. He grew up, btw, on a farm in southwestern Oklahoma. After six years at the Grand Canyon he transferred down south to the beautiful Arizona desert. The man is a natural naturalist and outdoorsman, and extremely nice American guy. 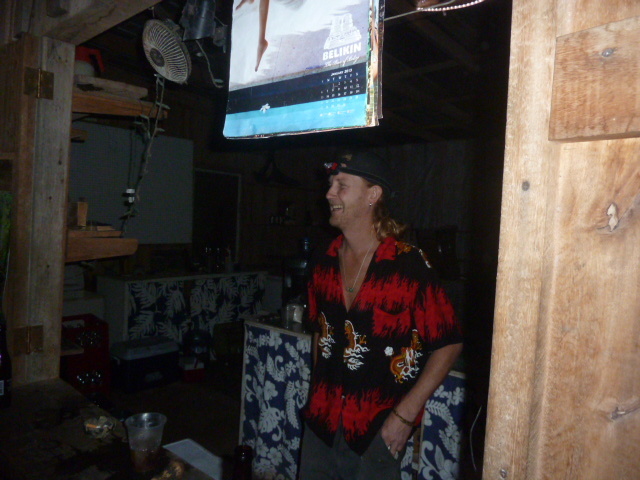 One thing I love about Belize is some of the really interesting Americans I happen to meet down here. 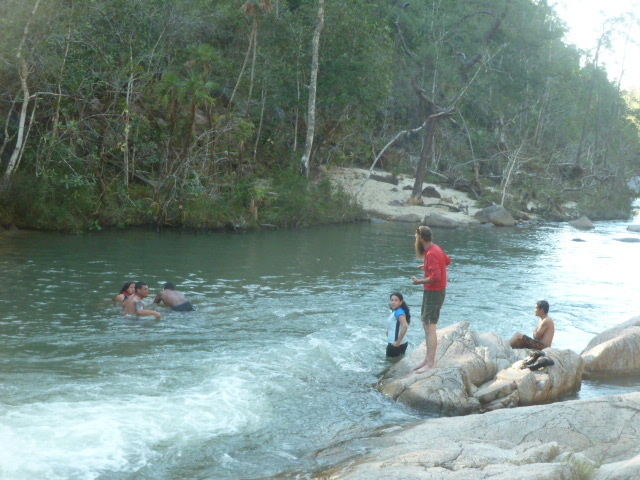 Big Rock is a great place for swimming or floating around in a tube or just sitting on a cool, camp rock and chilling. Many a wedding was held here at the foot of what used to be Five Sisters Resort, only a couple of miles from “Big Rock” and another mile or so from Francis Ford Coppola’s famous Blancaneaux Eco Resort, which I’ve featured here at the blawg a few times. The Five Sisters Resort fell into disrepair while it was on the market. Now called Gaia Riverlodge, it sold to a new owner two years ago. 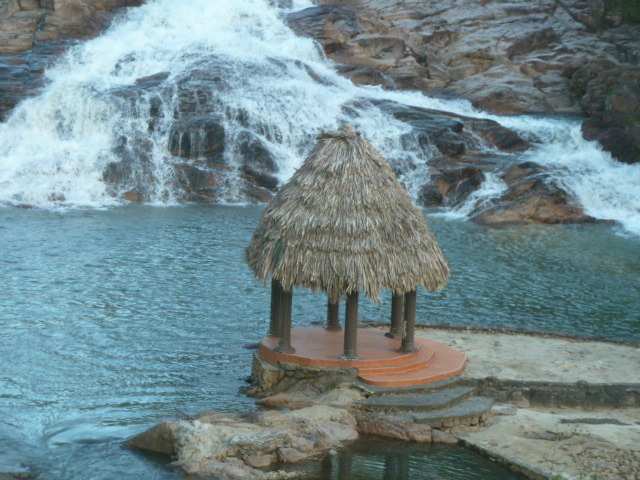 It’s almost been restored to its former glory and is a beautiful resort with this great waterfall deep down below it. It’s an even steeper climb to access than the waterfall at Big Rock, but the resort has a nice, winding trail of concrete steps to make it accessible. Still, the climb up and down is a workout. I’m in reasonably good shape and can hike for miles a day around Belize. But my thighs were screaming with soreness for a couple of days after the hikes around Big Rock and Gaia’s waterfall. Being in good shape in Belize empowers you to escape to some of the most beautiful, rugged, serene and secluded places on God’s green earth. Then again, you could just be lazy and take the tram down to the Gaia waterfall. 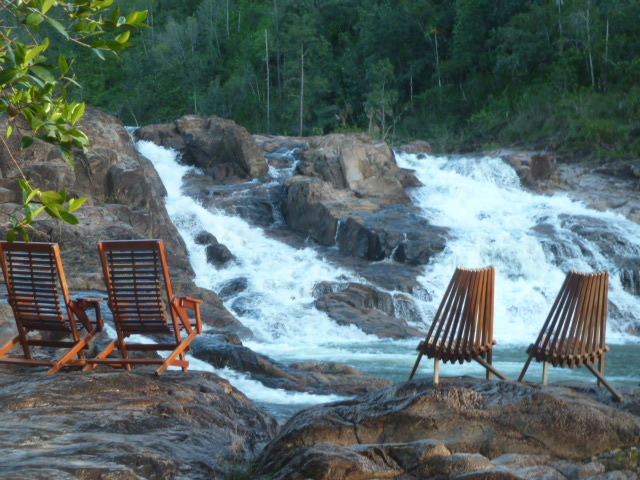 For more about the Gaia Riverlodge …..
and a full gallery of pictures…..
Zen chairs compliments of Gaia Riverlodge. 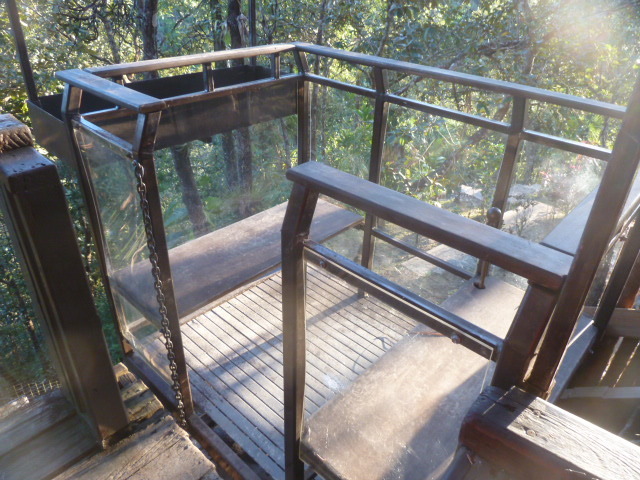 If you don’t want to take the steep steps or tram all the way down to the waterfall at Gaia you can stop and take in the view at one of the many lookout points. But this view down at ground level is one I’ll take every time. 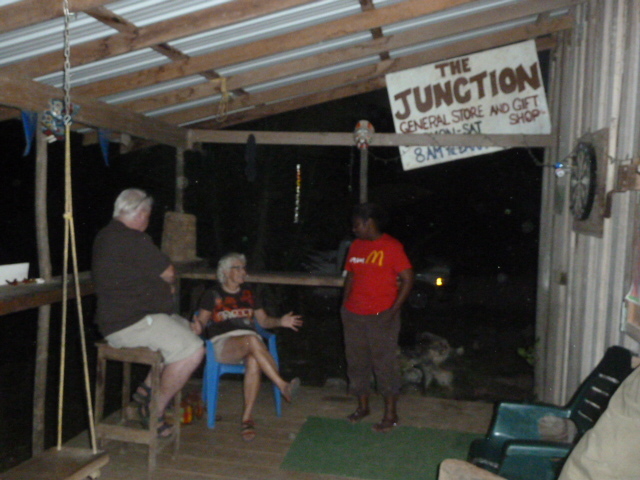 On the way back to San Ignacio be sure to stop at The Junction, a popular watering hole at the base of Mountain Pine Ridge where you can always find expats from the States or Canada having an ice-cold beer with the Belizean mountain folk. It’s got to be the most laid back, relaxing, little jungle tavern on earth. The lady in the middle is a Canadian who moved to Belize 12 years ago after driving her truck from 4,000 miles from Calgary to Houston where she shipped the truck to Belize. That’s her brother who lived with her a couple of years here in Belize before he built his own cabin a few yards down from The Junction. Like I say, you meet the most interesting North American expats down here–some really adventurous people who march to their own drummers. My kind of peeps. (The young lady on the right is Dee, one of the four college student/campers I transported back to San Ignacio Saturday night. The mother of two sons ages 8 and 10, Dee is back in college for outdoor eco studies but has a teaching degree. That’s Jim, the very outgoing owner of “The Junction,” he of British and Australian parentage. His wife is from some strange place called Louisiana. They own the legendary Junction and the 40 acres of lush Belizean bush land behind it. Excellent advice! I was ready to move to Jamaica until we spent a week there for our 20th anniversary. Stay in the hotel compound is heaven – leave and take care!